This page I did at home, on my own, by myself, late at night. That's when I work best. I love it.....but that's just my opinion....it's ME! Layers, and layers of Dylusions Sprays, some ghosting, stencils, then stamping, pen work and more pen work in her Journal. The colors speak to me. The stamps are everywhere from Tim's Worn Text to Fancy Flourishes, they just don't take over. And the Stencils include Dyan's Checkered Dots, Number Jumble, and The Crafter's Workshop Daisy Doodad with various Dylusions Sprays. You may have seen this one on FB after I completed it at home. We started this one in class. All the pages we did were backgrounds and starting points. I REALLY like this page, the skirt and model are just too cool! Journaling a page takes time, and for me, being by myself to just work in the privacy of my studio. I rarely like anything I do in a class....but this class was perfect for me, as I could finish it at home. This is a fun exercise that I cropped because it didn't have very good composition...for me. I think the model's picture is the best part of it, not my journaling. She's gorgeous. 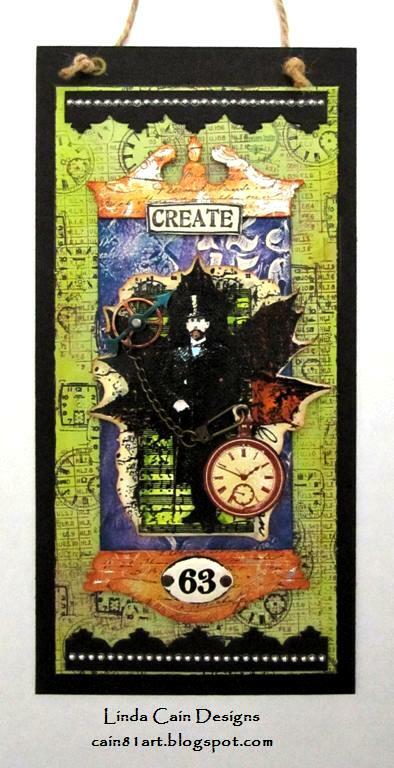 And this is another fun piece we started, and learned a great deal from using the Journaling Block. I don't like my page a whole lot, but I learned from it. Sharing the good, and the not-so-good! The word NOTES was cut from a magazine. I'll take that learning ability and make something more "me." Like Dyan says, "nothing is ever wrong in journaling." Do it again, and make it your own! Have you seen the little Mini House Shrines from Retro Cafe Art???? Well get on board and take a look, order some and get in the Swap!!! They are wayyyyy toooo much fun. I'll take you through the making of the first one here. So, no more excuses that you don't know how. This is how they come. Flat and made from Masonite. I laid them out and painted with the Broken China Distress Paint Dabber. Now you'll have to forgive me, this was taken with my camera phone at night before I knew what I was doing, and so it looks more Turquoise than it should. But the rest should look correct in color since they're with my regular camera. When the paint is dry, stamp with Jet Black Archival Ink and the new and FABULOUS Cling Stamp Set - Sunrise Sunset from Finnabair aka Anna Dabrowska and Prima Marketing. I LOVE everything in this Collection...WTG Finn! This is a Masonite Star that I dabbed Brushed Pewter Distress Paint on for the bottom. The top layer is painted with Mustard Seed and Spiced Marmalade. I glued the sides, bottom and back together. Then I laid some tulle inside and glued. I added Gold and Blue Sharpie pens to the silver Bird Charm and tied a piece of black Paper String to it. Then glue the String to the sides to support the charm where you want it. But before I glue the roof on, I traced the sides and back onto the Sunrise Sunset paper from the 6x6 pack. This is the gorgeous Clear Stamp set from Finnabair stamped with Coffee Archival Ink. Is this a beautiful contrast or what??? NOW glue the papers to the outside of the house and the inside of your roof. I decided I wanted the stamped image on the OUTSIDE of the roof, so now that you've glued the tulle inside with the charm, trim the paper string close, and glue the roof on. The Star is stamped 4 times with the stamp shown from the Cling set using Jet Black Archival Ink. The roof has a Sequin colored with a Sharpie permanent marker, and a Clockpart glued to the center. See the lighter colored paper INSIDE on the roof? Contrast makes it easier to see sometimes with lighter colors inside....just a tip here. Gold Nailheads brighten up the front and rooftop are like little lightbulbs. The Black Glaze Pen and White Sharpie Poster Paint Pen add some dots along the edges. I love the little Inspire Sign from Red Lead and the Mini Gear from RCA. The round Stand is glued to the bottom to raise this piece up just a tiny bit more. But I couldn't stop, I took a wooden cap and hand-painted it up to raise it even more. Here's one I'm mailing off for the Swap. The charm is dropped from the center with a wire and jump ring. Kinda tricky. More stars here and a better look at the Theatre Character Stands you can get. The Butterfly is from RCA, too. It's hard to see, but the cut off Memo Pin is stuck in a little wooden spool with some black tulle. This house has embossed Metal Foil on the sides with Alcohol Inks. And this little guy just had to be done. The Skull charm and Chair were so fun in the first one, I had to do another one. This is your chance to use up that stash. Other Products: Ivory Tulle, Gold Nailheads, Silver Sequin, Orange Sharpie-Permanent, White Poster Paint Sharpie, Wooden Cap, Various Adirondack Sprays and Perfect Pearl Mists. This is not up everyone's alley....but someone I know will love it! The Mini House Shrines are from Retro Cafe Art Gallery and can be found on Kristin's site here. You get 2 little Masonite houses in each kit, one short and on tall...the tallest just 2 1/8". They come flat and you decorate them 1st, then with a bit of glue, put them together. It's really cool because you can stamp and paint the inside 1st!!!! Brilliant! These little guys are soooooo much fun, they're really addicting. I just got some Metallic Distress Paints and Tim Holtz Remnant Rubons. Here I used the Antique Bronze and Brushed Pewter dabbed on for background. When dry, I added the rubons....pretty cool, eh? Using a small amount of glue, you can put your house together now. I used an old computer resister and a bead to make the topknot on the Skull. I cut the loop off the Antique Brass Vintage Chair Charm and glued the Carved Stone Ivory Skull Bead onto it. The Dice Beads were colored with Terra Cotta and a bit of Bottle Alcohol Inks to age. Really like how they turned out. This is a piece of Glossy Cardstock that I added Alcohol Inks to ......many moons ago. The Gold Mixative really stands out. The stamp here with Jet Black Archival Ink is just too beautiful for words!!! It's the new one from Finnabair and Prima Marketing Cling Set- Sunrise Sunset collection. The papers in the background of the pictures are from her 6x6 paper pad. Aren't they glorious?!?!?!! The detail is amazing. This will go on the back of the house. The Brown Vintage Washi Tape is shown here on the sides. I used Glue n Seal to make sure it stays! And the roof is Embossed Metal Foil Tape with the same colors of Alcohol Inks as on the Dice. The White Clock Hand had the lower piece cut off...not an easy task I must say, and glued to the peak of the house. The hands are some from an Art Doll Arms I bought long ago that I bent to come around the sides...I kinda like them. Kristin has similar ones here. Lastly I added pen dots with a Glaze Pen all over....you know me...gotta do it! You have to lay the house down and shoot from the top to get a good picture of the insides....at least it worked for me. So take a look at all the great things at Retro Cafe Art, just click on the links here, and give one of these a go. Next post will be a step-by-step tutorial using paper and stamps on another Mini House Shrine. There's a Mini House Swap going on now until May 13th....still plenty of time to enter here. Well, we all knew it had to come to an end...sadly, today is my last post with the absolutely fabulous PaperArtsy, as a Guest Designer. It was the experience of a lifetime, and I could not have had more fun! ...sob...BUT, I will continue to use their wonderful products, (new stamps on the way to my house as we speak) so keep checking in to see what we've come up with together! Having said that....here's what I did for today. I had someone ask me to PLEASE make something GREEN! You know who you are.......ha...........so, I created a Journal Page that is basically using green. It's my last day on the PaperArtsy Blog, so if you'd like to see this step-by-step, jump over there and take a peek! There are lots of layers and colors to check out, so hit the link and enjoy the trip! I could not be more grateful for the time I've spent there on the the DT. Leandra and Gillian have been nothing but the BEST. My thanks to everyone who has traveled along with me. It's been a ride of a lifetime!!! I've had this picture of myself reproduced a few times, but never really added it to anything for my wall. I thought it would be the perfect size for this project. Today I thought I'd break out the PaperArtsy Fresco Chalk Paints and create a little treasure. I haven't changed a whole lot...still built sturdy and wearing comfortable shoes!!!! The little Ink and the Dog Mini Stamps are just the thing for projects like this. You can't have too many to play with!!! So if you want the whole tutorial on this project, jump over the the PaperArtsy Blog and see all the details. Join in the Challenge and have a chance to win a prize!!! I'll be there all this week with projects and tutorials! The Exquisite Shrine Kit is from Retro Cafe Art Gallery here. This project for the PaperArtsy Design Team is full of fun techniques and ideas! I LOVE all the wonderful stamps in this piece. And the Fresco Paints are to DIE for!!! I could not have imagined how amazingly different they are from anything I've ever used before. I am still in awe of them. Here I use them on METAL!!! It's difficult to get a good picture with metal since the glare makes it a nightmare to shoot. 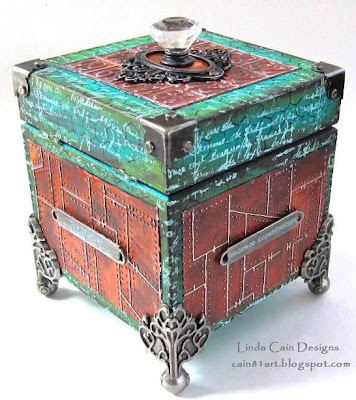 But this is definitely my favorite since it has everything in it....metal, paint, stamps, ink, die cuts, embossing powder, markers, stencils and modeling paste! Layers, and layers, and more layers!!! HERE! And don't forget to join the Challenge for a chance at a great prize. So jump on over to the PaperArtsy Blog and follow along! This time I've got some tips and a tutorial over there to make an adorable little treasure. Stencils and paste are the latest craze, and this has them both! So grab a cuppa and head over there to see the makings of this little project. It's fun, it's pretty easy, and you'll have a new little project to love. And don't forget to enter the Challenge to win a prize at the end of the week!!! UPDATE: So sorry, I forgot to share the link...it's now on this page! 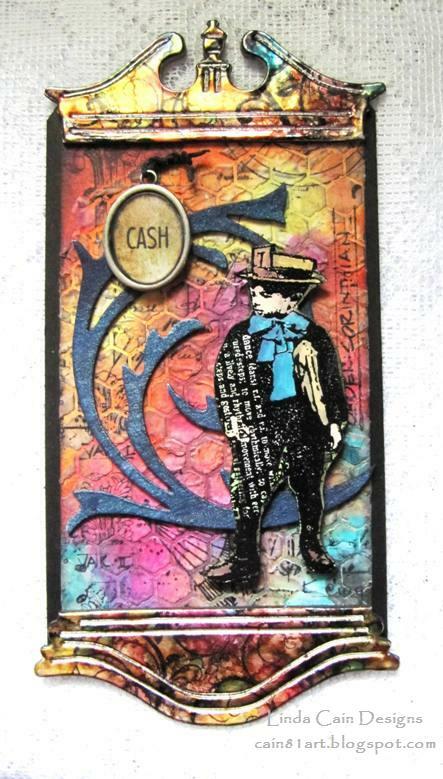 I LOVE the new die from Tim Holtz.....Pediments! ...what more could you ask for??????? I started with a tag and the Chickenwire stencil from The Crafter's Workshop. I used the Flexible Modeling Paste that I had and a palette knife to add it to a majority of the tag's middle area. I'm sure all kinds of paste out there works much the same way, but the key here to the bright colors is the extremely white color of the paste. I, of course, can't wait, so I dried it from the front and the back with the Heat It tool. Keep it moving so you don't bubble your paste. When dry, I applied the Distress Stains generously letting the areas where different colors touch blend and create more colors. Persimmon and Raspberry???? YEAH! What a gorgeously bright color it made. Could have stopped before the Black Soot arrived at the bottom, but it's OK since I cut it off anyway. Then I broke out the stamps and the Archival Ink. I mainly used the Classics #2 stamp collection all around the tag, but there are 2 spots of Script from the Apothecary set. The Metal Foil Tape is added to thick plain chipboard and diecut using the Pediment die. I LOVE this die!!! The Alcohol Inks were added with the Blending Tool and Felt all at the same time. They backrun into each other if you let them dry and reapply. The trick is knowing when to stop. For those eagle-eyed people out there, you know who you are, the bottom pediment was a bit too blue for me, so I use a different one on the finished project. FYI. When dry, add little Flourish stamps with Archival Ink. The little guy was stamped with Archival Ink onto Specialty Stamping Paper, and embossed with Super Fine Black Embossing Powder. The Flourish was cut from Chipboard and sprayed with several colors of Adirondack Color Washes and Perfect Pearls Mists for a class a long time ago. It was just calling my name to be used with our little man here. I cut him out and added a few Distress Markers to color him in. Then I flipped him over and added some pieces of chipboard to layer him up a bit. I didn't want the tag hole to show under the Pediment, so after layering the tag onto Black Chipboard, I cut about a half inch off the top and bottom. It had better composition in my opinion. I added some Black Soot over the top of the raised areas to make the color pop a bit. Glue on the Pediments and add the other embellishments. The last spot that needed something had a Cash Key tied with Waxed Linen glued to it. This also shows a better look at the Pediment without all the glare. The inks on the metal are really cool. I hope you have as much fun with these products and I did. Most can be found at Inspiration Emporium. Late night is when I get my best ideas. Laying in bed, of course, lights off, everything shut down, studio cleaned up....yeah right! Not very often. But this time I didn't get out of bed, turn on the lights and grab what I'd been thinking about creating. I waited until morning and tried my hand at embossing metal and adding Vintaj Patinas. So, I needed a thank you gift for someone who'd helped steer me in the right direction with a problem, and this reminded me of their type of interest. 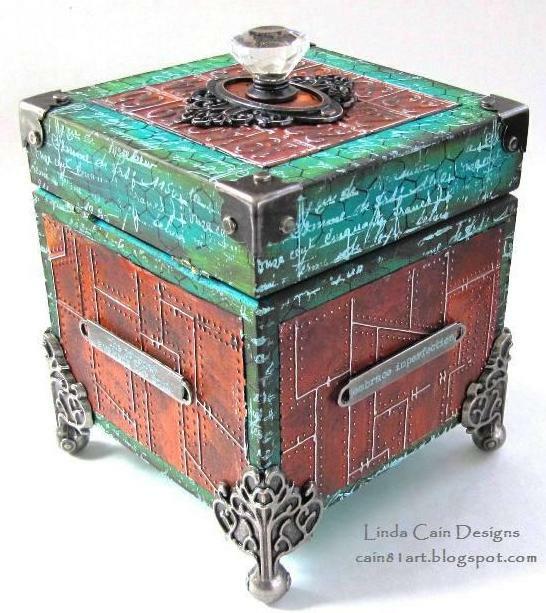 This started as a plain wooden box that I painted with Studio Classic Teal and various other paints dabbed over it with Cut N Dry foam, then stamped. The Metal Foil is embossed with the Riveted Metal Texture Fade. This is 3 colors of Patinas... Cinnabar, Rust and Clay...the Rusted Hardware Collection. Dried with a heat tool, and some French Roast Fresco paint dabbed on. Dry again, sand it here and there, and polish with a soft cloth or Detailing Block. I added the metal easily since the foil has sticky back, cut a piece of Grungeboard with a die and painted to match the orange/rust color for the center of the Ornate Plate. I added the Curio Knob and Box Corners to the wooden box. and glued to a side of the box. The Foundations Box Feet are added last. I stamped the Mixed Media stamp with Jet Black Archival Ink and the Script from Apothecary in Mermaid paint with a rolled application to make spotty. These are two of my "most used" stamps in my collections! So try the Patinas on some embossed metal and see what you think. I think the Rustic feel is great with a Turquoise Paint in contrast!!! Most of the supplies can be found by clicking the product link to Inspiration Emporium.